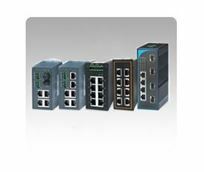 Browse here for fast Ethernet switches designed to work in a variety of industrial environments. These entry level DIN-rail-mount unmanaged Ethernet switches offer a reliable, robust, and cost-effective solution to most of the simple network topologies. With IP30 rating, all of the unmanaged switches are certified for Industrial EMC (EN61000-6-4 and EN61000-6-2), and support redundant power-input for enhanced safety that can be connected simultaneously to a wide range of DC power sources. If one of the power inputs fails, the other live source acts as a backup to provide the power needs automatically.